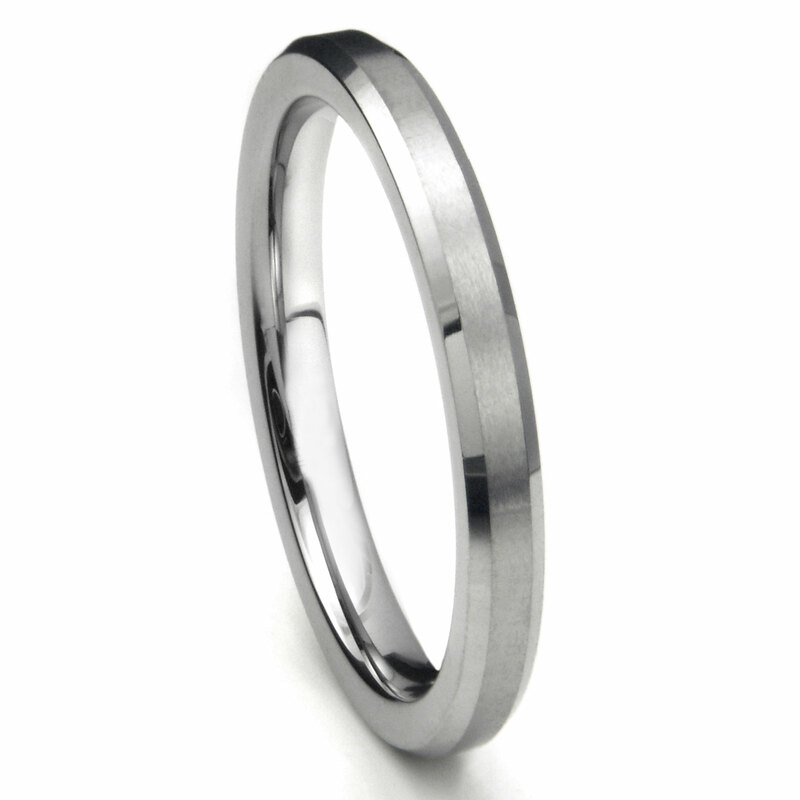 Our tungsten carbide 3mm beveled wedding band with brush center is one of our more classic wedding ring style bands. The 3mm width makes it the perfect size for women who enjoy a more traditional style wedding band. It is made of high polish tungsten carbide with a brush finish on the center of the band, running parallel to beveled edges of the ring. The tungsten carbide 3mm beveled wedding band with brush center makes a great classic style wedding band which can easily be match with a thicker ring and make the newlywed couple very happy. One of the great features of this wedding band is it will look good years from now, it won't tarnish, nor will it bend, crush, or break. It is almost nearly impossible to scratch as well. As with all of our wedding bands the ring is backed with a 100% lifetime warranty. Be sure to shop our entire line of titanium and tungsten jewelry. Titanium Kay is hands down the best online source for wedding bands. Very high quality, great customer service, and lightening speed shipping! I love this ring. Not only was the price terrific the look is as well. I wanted a durable wedding ring that was small with a bit of shine but would hold up to the work I do with my hands. This was that ring. Shipping was super fast as well. Simple, understated, and elegant: I look forward to having this on my finger for the next 50 years. Good quality ring. Looks great. Very thin, hardly know i am wearing it.